This photograph shows the American Humane Education Society (AHES) booth at the South Carolina State Teachers’ Convention for Colored Teachers, an event that took place in Columbia, S.C. at the end of March, 1925. 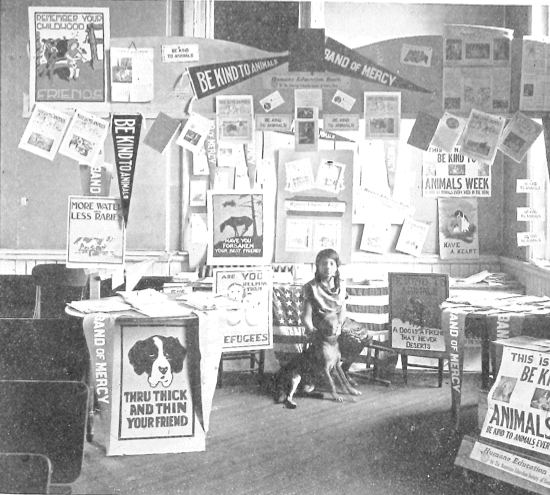 In addition to the pamphlets and literature that the AHES provided to teachers about Humane Education, this booth contained posters, banners, flags, and pennants with messages promoting kindness and compassion towards all species. In these materials a combination of image and text worked to promote a sense of empathy with other creatures. For example, near the centre of the booth is a poster that shows a horse standing in profile under the tree. The horse’s body language conveys the message that this is an animal that is tired and old, perhaps from a life of heavy labour. The horse’s posture also suggests that this animal may be lonely or sad, something that is reinforced by the text of the poster: “Have You Forgotten Your Best Friend?” Both the horse and tree are rendered in silhouette, a graphic technique that makes the white text of the poster stand out. The stark graphic elements coupled with the text asked those who saw the poster to consider the emotional capabilities of an animal like a horse in the hopes that it would trigger further reflection on how these and other animals were treated.